Offering four types of rooms, every room is meticulously furnished with your utmost comfort in mind. 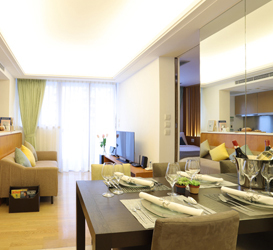 Studio Room Size: 395 - 401 sq. ft. 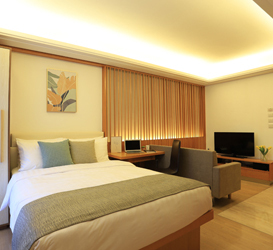 Studio Deluxe Room Size: 408 - 455 sq. 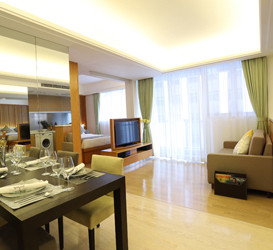 ft.
Deluxe 1-Bedroom Room Size: 571 - 575 sq. 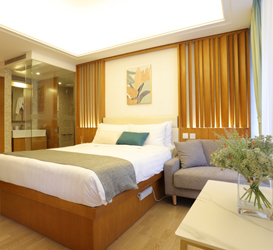 ft.
Executive Suite Room Size: 672 sq. ft. The images shown on this page are taken in GardenEast on particular dates. Please refer to disclaimer at the bottom of this page.The layout plans are for reference only and are not drawn to scale.